Nancy is an internationally known sports nutritionist and best-selling author trusted by many top athletes. Nancy is a registered dietitian (RD) and board certified specialist in sports dietetics (CSSD). She offers one-on-one personalized sports nutrition counseling to casual exercisers and competitive athletes at her private practice in the Boston-area (Newton). She teaches her clients how to have more energy, lose undesired body fat, enjoy a winning sports diet—and feel confident about their food choices. Nancy’s “how to” books on nutrition for sports and exercise, including her best selling “Nancy Clark’s Sports Nutrition Guidebook” and her food guides for new runners, marathoners, soccer players and bicyclists, are popular resources. They include tips on daily eating and how to effectively lose weight. 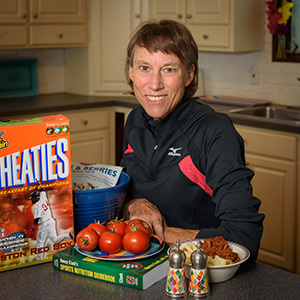 Nancy also has created sports nutrition handouts and PowerPoint presentations that are available for purchase by nutrition educators and professionals throughout the country. Some of the more renowned clients that have relied on Nancy’s expertise in diet for sports conditioning to gain a competitive edge have included members of: Boston Celtics, Boston College, and many collegiate, elite and Olympic athletes from a variety of sports. She has been Team Nutritionist for the Boston Red Sox baseball team. A few of the topics covered include importance of nutrition in sports conditioning/training and diet, triathlon training, proper nutrition for endurance sports and strength/power sports, how to lose undesired body fat with the right balance of exercise and diet, and how to correct dieting gone awry.